After his wild adventures with Pacha and Emperor Kuzco, lovable lug Kronk, Yzma's former henchman, has happily started a new life as the head chef in his very own diner. An all-new wacky adventure begins, however, when a llama-gram arrives telling him that his father is due for a visit. Before you can say "squeaker, squeak," Kronk is cooking up trouble with the sly enchantress, Yzma, trying to make himself look like a success in time for Papi's arrival. After a bunch of big blunders and a massive cheese explosion in the restaurant, Kronk finds himself covered in a heap of trouble. It is only with the help of friends both old and new that Kronk learns to be true to his groove. Although most sequels follows the further exploits of their predecessors’ main characters, occasionally some will take a different path and track the adventures of supporting roles. 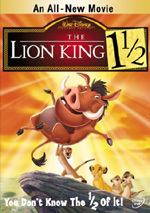 From Disney, 2004’s Lion King 1 ½ did this, though one could argue it’s a “midquel”, not a sequel, since it takes place in the middle of The Lion King. No one can question that Kronk’s New Groove acts as a true sequel to 2000’s Emperor’s New Groove, however. The story takes place about a year after the events in the original and follows Kronk (voiced by Patrick Warburton), the muscle-bound former crony of evil genuis Yzma (Eartha Kitt). As was the case with the first movie, this Groove opens with its lead character down on his luck. Kronk tells us that he had it all but let everything get away from him. We learn that Kronk wants nothing more in life than to get a simple “thumb’s up” from his stern, disapproving Papi (John Mahoney). Because of this, Kronk lies to Papi and pretends to live in a big house with his wife and kids. In truth, Kronk has no house, wife or kids. Through Groove, we flash back to his attempts to obtain these and the disastrous results before Papi finally arrives. If nothing else, I have to give this Groove credit for its unusual focus. As I noted earlier, sequels don’t usually concentrate on secondary characters like Kronk. That’s probably a good thing, if this lousy sequel is any indication. On the positive side, Groove brings back all of its original main actors. This means that in addition to Warburton and Kitt, we also find David Spade and John Goodman, the leads from the first flick. We also get some returning supporting talent like Wendie Malick and John Fiedler along with good new actors such as Mahoney and Tracey Ullman. Don’t expect a lot from Spade or Goodman, unfortunately. They essentially do cameos and don’t play significant roles in the story. I don’t know if they appeared due to a contractual obligation or as a favor, but neither man does any heaving lifting during their brief moments on screen. This leaves Groove to live or die with Kronk. Unfortunately, it completely sinks. Kronk was a fun character in the original, but he can’t carry a movie on his own. He’s a quirky sidekick, not a leading man, and that factor makes the film drag. Its absolute lack of inspiration doesn’t help. Expect many of the same lines and gags from the original movie to repeat here, but to much less effect. This Groove takes the wild tone of its predecessor but stays on cruise control with its jokes. Superficially, it seems clever, but too much of the material feels borrowed, and it provokes precious few laughs. By “precious few”, I mean “none”. I didn’t laugh once during this turgid affair, and I don’t think Kronk’s New Groove could even prompt a smirk or a grin. I can’t recall the last time a short movie moved so slowly, as I worried this dull and lifeless affair would never end. 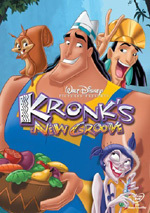 Kronk’s New Groove appears in an aspect ratio of approximately 1.66:1 on this single-sided, dual-layered DVD; the image has been enhanced for 16X9 televisions. Groove provided a strong transfer that largely matched up with the stellar visuals of its predecessor. Sharpness appeared absolutely immaculate at all times. I never witnessed any hints of softness or haziness as the movie always seemed wonderfully crisp and detailed. No jagged edges or moiré effects appeared, and print flaws were absent as well. The film seemed gloriously clean and fresh. 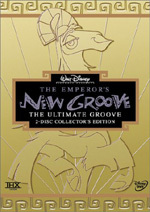 Groove featured a broad spectrum of colors, and the DVD reproduced them well. Not many films offer this much variation in hues, but you’ll see a wide array of purples, reds, blues, greens, yellows, and pretty much everything else here. The colors always were solid and lacked any signs of noise, bleeding or other concerns. Black levels were deep and rich while shadow detail seemed appropriately dark but never excessively heavy. Ultimately, the DVD presented an exceedingly-satisfying picture. The soundtracks of Kronk’s New Groove were fine, though they didn’t quite match up to the highs of the picture. Groove offered both Dolby Digital 5.1 and DTS 5.1 soundtracks. To my ears, I could detect no differences between the two mixes; they seemed identical. Although the track occasionally showed some surround usage, for the most part the audio stuck strongly to the forward spectrum. Across the front channels, the sound presented a nicely broad array due to a combination of stereo music and some strong ambient sounds. Effects weren’t quite as wild as I might have expected from this kind of frenetic film, but they seemed compelling and acceptably active throughout the movie; sounds popped up in the correct places and they panned well across speakers. Surrounds were also somewhat less active than I might have thought they’d be, but the rears added a nice kick to the mix and made it a fun and appropriately frantic affair. Audio quality appeared good but not great. Dialogue always seemed crisp and natural with no signs of edginess or problems related to intelligibility. Effects were quite clean and realistic, and when appropriate, they showed some solid dynamics. Music sounded clear and bright but usually lacked much low-end. The dance tracks heard during the “Cheer Off” pumped good bass, but the rest of the track seemed a little anemic. Overall, this left us with an erratic but generally positive pair of soundtracks. Only a few minor extras fill out this DVD. In the “Games and Activities” area we start with Kronk’s Brain Game. This requires you to pick methods to solve some problems before another visit from Papi. It requires some odd logic but becomes reasonably cute and fun. For a little information about the film’s creation, we move to How to Cook A Movie. Hosted by actor Warburton and directors Elliot M. Bour and Saul Andrew Blinkoff, this seven-minute and 54-second piece includes additional remarks from producer John A. Smith, writer Tom Rogers, actor Eartha Kitt, animation director David Block, and art director Mary Loratell. It rips through the production basics in a hurry, so don’t expect much detail. It acts as a very quick primer for kids, though, and is fine for that purpose. It includes a few fun looks behind the scenes as well, so adults may find some interesting shots. The DVD opens with ads. We get promos for Lady and the Tramp, The Wild, The Shaggy Dog, and Bambi II. These also appear in the Sneak Peeks area along with trailers for Leroy and Stitch, The Fox and the Hound 2, Pooh’s Grand Adventure and The Emperor’s New School. If you hope to find the sense of manic found contained in The Emperor’s New Groove within the 75 minutes of Kronk’s New Groove, expect to walk away disappointed. The sequel features the same form of comedy but provokes absolutely none of the original’s charm or humor. This is a deadly dull and limp film. The DVD offers excellent visuals with good sound but lacks substantial extras. Even if you loved Emperor’s New Groove, avoid its crummy sequel. Actually, especially if you loved the original, you should skip this dud. It won’t even remotely remind you of the fun you had in the past.